For many years the Town of Shoreham held an annual running event - The Apple Blossom Derby. Originally it was organized by a group of orchardists in town to recognize and support the wonderful apple growers of Shoreham. Then it became a fundraiser for the preschool, and later the elementary school, and a celebration of the start of apple season. After several years of dormancy The Friends of the Platt are bringing it back in celebration of apple harvest time, now called the Orchard Run at Apple Fest! All proceeds to to support the Platt Memorial Library. There will be a 5k and 10k run/walk on the morning of Apple Fest. All are welcome and after the run there will be all the fun of Apple Fest to stay and enjoy, with lunch discounts available for runners. 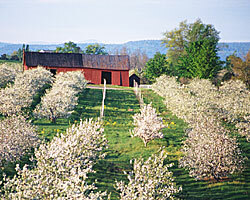 Come savor the beauty of the apple orchard countryside of Shoreham, Vermont on this great loop course! This will not be an officially timed race though there will be a large clock at the finish for you to time yourself. Rather than traditional medals or prizes, there will be a raffle prizes available to all registered runners. Prizes will be given at noon to kick off Apple Fest. Registering online is the only way to guarantee yourself a race t-shirt. Registering on the day of the race will be $5 more than the pre-register rate.